I sit before a large painting I am ready to trash to fret about my feelings towards it. Soon I am slapping paint all over the canvas. Into my Bengali spice tea of cinnamon, vanilla, ginger, chicory, carob, black pepper, cardamom, cloves and nutmeg, I add blackcurrant. Ahh. Anchored in my mind all day, a koan. What in death does not die? I brush a wash of India ink onto paper. Ground burnt bones thickened with resins. Words in the wet wave. Words in the black tusk of the whale whose skin swims with algae, barnacles, skeletal memories of cattle, the backbones of live fish in the orange sunset that beaches the creature like a hammerhead of knuckles. The creatures of the world fight for their lives. In the mass extinction. In the radioactive orange water into which the sun has fallen. The salty sludge-lined ocean, layers of plastic bags hugging the sand, shopping for the moment. It was a Zen moment. What in death does not die. Our tongues fork into each other. The undersides of clouds splatter slithers of rain meandering down the panes. Slow, meticulous cutting of patterns, sewing. Each second is a stitch; each hour a finished seam. Our lives are the garments we wear. In the Annex's wealthiest areas, the streets are empty. No cars, no porch-sitters, no children, no-one out watering their front gardens. My dog and I walk. Unencumbered silence. I lay in the park sketching the tree; though invisible to the biological eye, she was there. Neither did the lake exist, nor the rocks. It was sunny and yet I found a sliver of a moon and a star on the paper. The child in me saw her. She is like a paper cut-out, drawn as a child would draw; she is Daphne. Look at her laurel crown. Her arms are turning into branches with leaves. 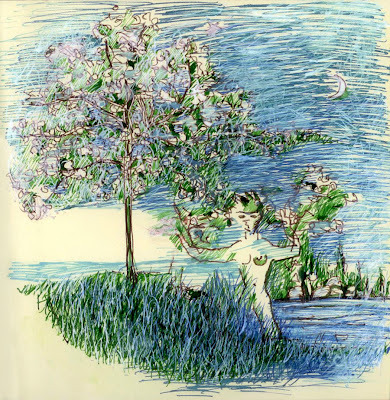 I found her ghostdrawing her myth in the green dreaming imagination of the woman drawing in the book on her lap. This Daphne is caught, perpetually transforming, as night falls. Apollo, the god of light, long gone. No sign of Cupid's arrow, if it ever flew. Rain pounding, my sticky heat-riven body wet-soaked, like the laughing people passing by. Water criss-crosses the drought-white grass. The style here a little 50s, I thought. Post-Joycean, hyphenated word pairs. 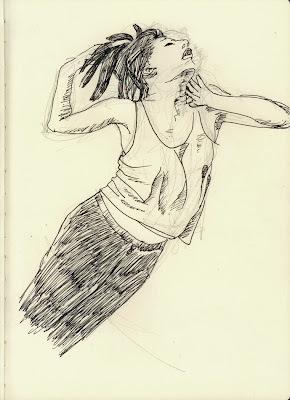 The Dancer with the Full Moon in her Throat, sketch 1, 2011, 20cm x 28cm, 8" x 11", India, ink, graphite, Moleskine Folio Sketchbook A4. 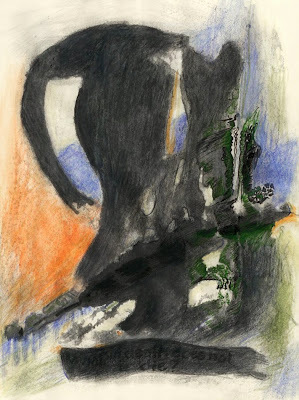 Instead of watching a movie, Fellini's 'Satyricon' on the burner waiting, saw it years ago, I drew. Been busy the past few days, and I should sit back, but I don't relax too well. From my Moleskine Sketchbook... hopefully finish in the morning. Or maybe stay up... the full moon needs to go in, I think she is dancing a dance of the full moon, and that means a dark sky, and lots of ink... the full moon is in her throat, I see it now, and in the night sky. She is reaching for her throat, for the full moon. The plum, dark purple skin, pearl yellow flesh, firm, a sharp juice, releases sweetness to the tongue, like swallowing the moon. Wherever I am touched, light summer dress, underwear, couch, skin on skin behind knees, head under braided hair, I sweat. The species will come to an end; perhaps she is the last radioactive woman. The sky has too many blue patches where the sun shines through for the promised thunderstorm to drench and cool. We wait, wilt. I stare at Inca stonework. We carve away at sections of ourselves, until we fit, until you couldn't drag a knife through us. Like a nymphaea, a water lily, lazing on the thick surface of river water in this heat wave of fan wind blowing across my skin. On my walk tonight I saw men flying sideways through the air in overcoats and bowler hats, graphite pencils gnawing on their shin bones. Her foot in a cast, they take the streetcar. They don't reach the door in time for their stop. The crowded streetcar continues on. Today I lay under a tree laden with seeds, her arms of wood nurturing sun and rain, her roots, the earth. Her leaves shaking like hair in the breeze. I lay under a mother tree. Baking in a humid heat wave with a 425° oven in a small apartment is trashed; instead, we politely eat tea-dipped store-bought donuts.